Responsibilities are a two-way thing, we are committed to giving you the patient the best possible care and service but this also requires you to do your bit too! Names - Anyone who is involved in your care will give you their names and the best way to make contact with them. Signs - We will make sure that the surgery is well signposted so that you can quickly and easily find your way around. Waiting times - The purpose of us running an appointment system is to help keep waiting times down but please understand that these waiting times can vary. We strive to keep you waiting as little as possible. Ease of Access - We try to make it as easy as possible for you to be able to access a doctor, although not always your preferred one. 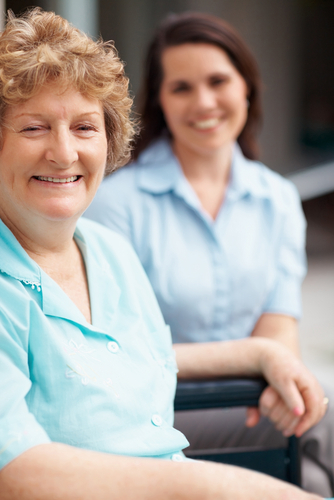 Where appropriate due to severe illness, disability or infirmity we will arrange for a home visit. Telephone Support - We have a dedicated team to operate the phones during the busy periods and will ensure that we have sufficient staff to cover at all times. Also you should be able to speak to a medical staff member via the Triage system. Test Results - Sometimes we require you to undergo some tests (e.g. blood or x-ray) and will normally be able to inform you of the results at your next appointment. If the doctor feels that no further appointments are needed we will advise you of how and when you can obtain the results. Practice Charter Standards - We run the surgery to an agreed set of standards for the benefit of all our patients. No care or treatment will be give without your express and informed consent. If at any point you are unsure please ask! We are here to help you. Data Protection / Confidentiality - Patient confidentiality is a prime concern to all who work within the NHS. You may be receiving care or assistance from other departments (such as Social Services) and there may be a need to share information. We will only ever use or share information about you if others who are involved in your overall care have a genuine need for it. No third parties will be liaised with unless we have your express written consent; although exceptional circumstances, such as health and safety of others or where the law requires us to disclose such information. Medical Record - You have a right to see your medical or health record subject to any limitations of the law. Your records will be kept confidential at all times. Respect - All patients are to be treated as individuals as part of their health care irrespective of their ethnic origin, religious or cultural beliefs. Information - We will provide you with full information about any service we offer you. Every effort is made to ensure that you receive the correct information which may affect your health and the care being given. Health Promotions – We operate health promotions and awareness to assist patients with good health and help avoid illnesses. This form of ‘self-help’ can be undertaken without reference to a doctor or nurse but if you are unsure of anything please ask to speak to one of medical staff. One of the most important things you can do is treat all our staff members with courtesy and respect. We operate a zero tolerance policy and any violent, abusive or racist behaviour will not be tolerated. Anyone behaving like this will be subject to Police action and will be removed from the surgery list with immediate effect. Please see our ‘Code of Conduct’ policy that is displayed in the surgery that explains how we expect you to behave when in the surgery or on the telephoneto a staff member. Your health is one of the most important things in life and you are the one responsible for it or any children in your care. We will happily give you any advice and support where necessary but please make sure you understand what is being said and follow any guidelines given. If in doubt please ask! Please contact the surgery if you are changing your address, contact details or name. Please note that if your new address is outside our agreed boundaries you will be required to register with another practice. The practice will only change names when they have been shown legal proof of the change. Please try to keep to your appointments. If you are having a problem attending please inform us as soon as possible. Patients who constantly do not attend may be asked to register with another practice…..
Only ask for a home visit if the person concerned is too ill or frail to attend. The receptionists are more than happy to arrange for a Triage staff member to contact you to discuss further. When contacting reception please keep you call brief and to the point, especially during the peak call times (08:00am – 09:30am). If further information is required we can arrange to call you back. If the call is not urgent please try and call after 10:00 am. Test results do take a while to reach us – you will have been advised when to call back for the results. Please do not contact us before then as we will be unable to help you. If the tests were organised by a hospital, please contact them for the results. If you are unhappy with anything to do with the surgery and have a complaint please contact our practice manager explaining your concerns. Our contact details are shown under the contact section of this website. NHS 111 aims to provide a high quality service. However, if for any reason patients are unhappy with their care or would like to give a compliment or make a suggestion about NHS 111 in their area, they should contact the NHS 111 Patient Advice and Liaison Service (PALS) on 01737 363866 or submit feedback online http://www.secamb.nhs.uk/contact_us/patient_advice.aspx.